Its unique color and award-winning, spicy fragrance have made it a garden favorite for more than 20 years. You'll treasure this glowing gem for its intense aroma (you can smell it up to ten feet away) and armloads of classically formed blooms! 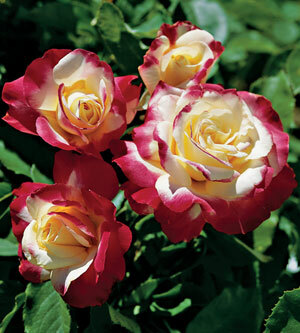 The scarlet buds whirl open to a white-washed pink that matures to buttery yellow and strawberry red. Recipient of All-America Rose Selections' highest honors. 3'-4' high, creamy pink to yellow with red blush. Urn shaped buds with 5"-6" blooms. 35-45 petals. 12"-18" stems. Glossy, medium green foliage. Strong, spicy-sweet fragrance. This beauty is also available in tree form, on a 3' stem, bringing color to a whole new level in your garden!